Imagine the vicinity of the village of Brooklyn in the 1800’s with narrow dirt trails and many trees. Coming to Wisconsin Territory from Illinois, Charles Nelson Sutterland and his wife filed for land for farming purposes in 1844. These fifteen acres, bordering Green County, were destined to be the original plat of the village on Section One of Brooklyn Township. Indians inhabited the countryside. Living near groves of trees and streams, they hunted for game and fished. Sometimes they visited in the scattered homes and made attempts of exchanging animal furs for tobacco, chickens, etc. After selling to Hiram Capwell ten years later, Sutterland moved to Rock County and operated a general mercantile business. Capwell cleared the land, opened a boarding house and enticed others to come to this small settlement. Previous to buying Sutterland’s property, Capwell was living in neighboring Rutland Village as a teacher. Capwell knew the railroad was looking a passage from Madison to Illinois. He realized his goal in persuading the Chicago & Northwestern Railway Company to lay their rails through Brooklyn in 1864. Rutland was campaigning for the rail passage too but lost to Brooklyn which buy lasix cheap online slowly, caused the demise of that village. Three years later, lots for commercial and residential use were surveyed by S.W. Graves and recorded in December 1867. 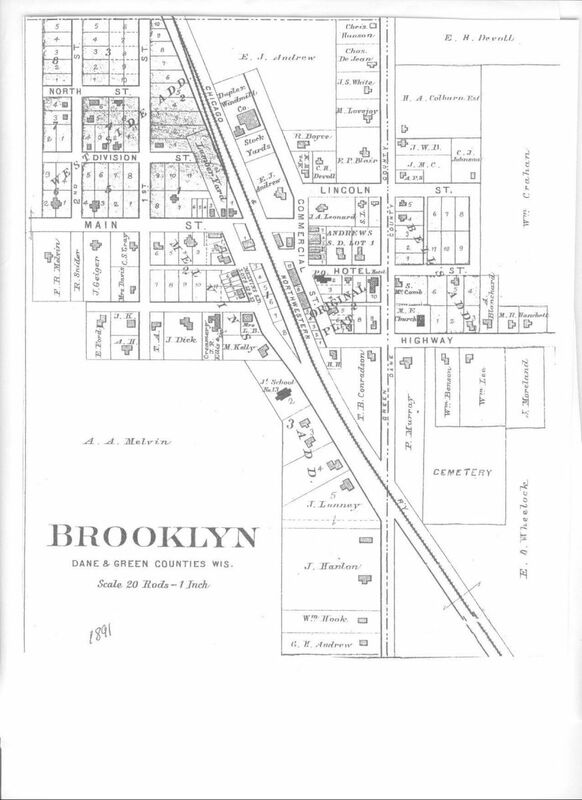 Brooklyn settlement wasn’t incorporated until 1905. The neighboring Brooklyn Township had already established in governing their land in 1849. The passing of the rails through Brooklyn spurred growth for this booming rural community. Retailers set up shop on both sides of the tracks. In 1884, there were four general stores (Ben Axtell, Samuel Adams and L.J. Wilder), one drug store (Albert Ellis), one hardware store (Samuel Adams), a large grain elevator and warehouse (Edmond Andrew), two hotels (Northwestern Hotel and D.H. Glidden Hotel), post office, two blacksmith shops (T.B. Conradson and Robert Clough), wagon & harness shop (Joseph Millspaugh), meat market, lumber yard, creamery (Brooklyn Cheese Factory), clothing store (E.W. Whitmore), shoe shop (Thomas Qualley), a doctor (H.C. Leach) and a barber shop. A graded school and a church (Methodist Episcopal) served the people too. The map shows the growth in the Brooklyn Settlement from 1854 to 1891.